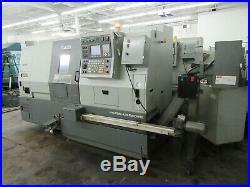 Hyundai-Kia SKT21LMS CNC Turning Spindle with Sub Spindle, Live Tooling, and Lexair Mini RhinoBar Barfeed. 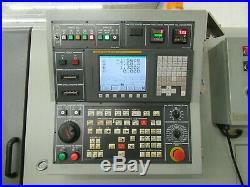 Control: Fanuc 0i-TC CNC. 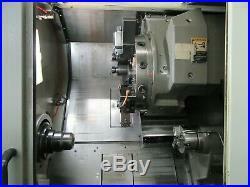 Main Spindle Chuck Size: 8. Sub-SpindleChuck Size: 5.3 3-Jaw Chuck. Max Swing Over Bed: 21.6. Max Swing Over Cross Slide: 13.8. Max Turning Diameter: 10. Sub-Spindle Travel: 21.6 B-Axis. Main Spindle Speeds: 4,000 Max RPM. Sub-Spindle Speeds: 5,000 Max RPM. 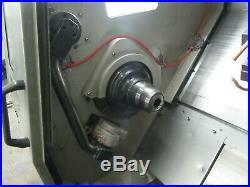 Main Spindle Drive: 20/15 HP. Sub-Spindle Drive: 5/3 HP. Main Spindle Orientation: Full C-Axis. Sub-Spindle Orientation: 5 Degree Indexing. Max Turning Length: 20.8. Main Bar Capacity: 2.6 Thru Draw Tube. Turret Capacity: 12 Stations – Live Milling Capable. Turret Travels (X/Z): 8.7″ x 29.5″. 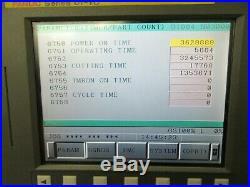 Live Tool Speeds: 4,000 Max RPM. Rapids: 1,417 IPM X/Z, 1,181 IPM B-Axis. 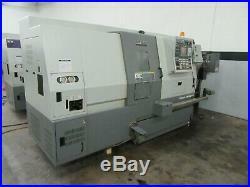 Fanuc Oi-TC CNC Control, Lexair Mini Rhino Bar MRB12-1.62 Barfeeder (12′ x 1-5/8″), 4000 RPM Main & Sub Spindles, C-Axis on Main Spindle, 5 Degree Indexing on Sub Spindle, 12 Station Turret All Stations Live Tool Capable, Tool Presetter, Parts Catcher and Conveyor, Samchully 8″ 3-Jaw Chuck, Samchully 5″ 3-Jaw Chcuk on Sub-Spindle, LNS Chip Conveyor, Chip Blaster High Pressure Collant Unit, Royal Filtermist FX900 Mist Collector, 1-5/16″ Spindle Liner, Static Tools and Live Tools Included, Machine Manuals. 200/220 Volt 3 Phase. 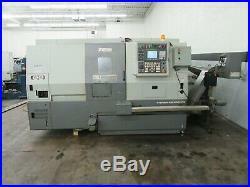 Approximate Machine Dimensions: 149.00″L x 72.00″W x 76.00H. Approximate Weight: 10000.00 lbs. FOB Open Top Truck. 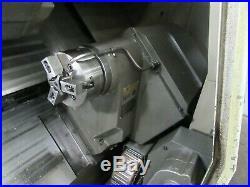 The item “Hyundai-Kia SKT21LMS CNC Turning Spindle with Sub Spindle, Live Tooling” is in sale since Friday, January 11, 2019. 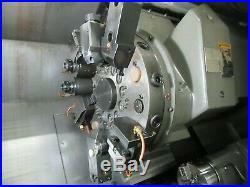 This item is in the category “Business & Industrial\CNC, Metalworking & Manufacturing\CNC & Metalworking Supplies\Equipment Specific Tooling\Lathe”. 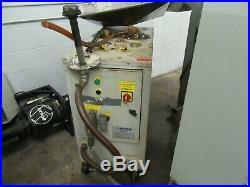 The seller is “machinesused” and is located in Minneapolis, Minnesota. This item can’t be shipped, the buyer must pick up the item.